At the workshop on Hypergeometric Motives, the view from my group's table during the afternoon problem session. Hard to see, but from left to right: John Tate, Philip Candelas, Henri Cohen, and Mark Watkins. 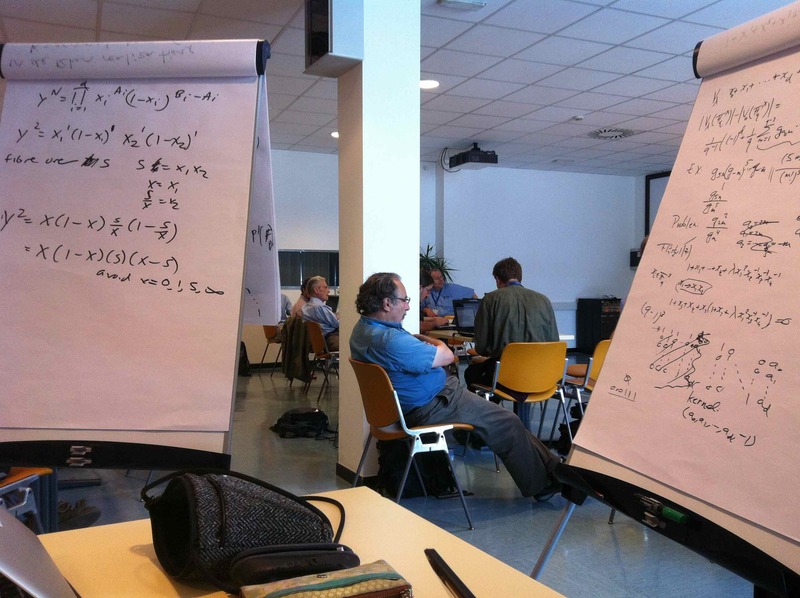 Conferences in mathematics come in many forms: from huge events like the the Joint Mathematics Meetings, to smaller gatherings focusing on a more specific area (for example, complex and p-adic dynamics). The traditional conference will have many talks, some keynote and maybe some smaller break-away simultaneous sessions. These are good places to exchange ideas and find out what other people are working on. But my favorite type of conference is not the traditional one, and in fact I am one of those people who starts getting distracted when a talk hits about 30 minutes (of course, this always depends on the topic, speaker, and the level of caffeine in my system). My favorite type of mathematical gathering is actually the workshop. I attended three this summer, and in this post I will write a bit about why I like workshops so much and then more specifically about each one. First of all, we use the name workshop for many things, and not all of those things are what I mean by a workshop. For example, the conference I linked to in the first paragraph, held at ICERM in February, was called a workshop I think because it brought in people from all over the world, not just the people who were in residence for the semester long program. But the structure was that of a traditional conference: talks, coffee breaks, and more talks. What I mean by workshop is actually more of a combination of talks and working or problem sessions. The idea is that you’re not only there to share ideas and see what other people are up to, you’re also there to learn something new and maybe even create new mathematics. In a way, the difference is that workshops are constructive, not just informative. In May, I attended the second week of the Georgia VIGRE Summer School (which this year focused on Algebraic Geometry topics), mainly because I wanted to learn more about Mirror Symmetry for a collaboration I’m working on. I like Summer School type workshops because they focus on a few specific topics (this week there were two courses), there are lectures in the morning and then problem sessions in the afternoon. These are not designed necessarily to lead to new research, but rather to teach a topic in a short amount of time. I actually particularly enjoyed the afternoon sessions (which were led by graduate students) since my background was not good enough to follow the lectures closely, but then I could ask many (silly) questions to the teaching assistants, and they pointed me to many useful resources to fill in some of my mirror symmetry gaps. Another conference in this style that I really like is the Arizona Winter School (which I attended pretty much all through graduate school). The Adriatico Guesthouse at the ICTP, where we had all of our meetings and meals for two weeks. 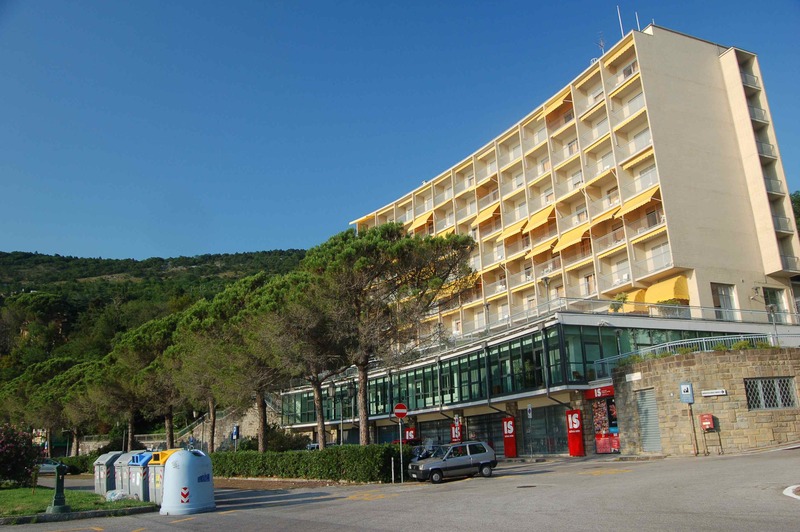 Later, for two weeks in June, I participated in the School and Workshop on Computational Algebra and Number Theory at the International Center for Theoretical Physics (ICTP), in Trieste, Italy. The first week of the workshop was a much more standard conference, but the lectures were introductory and served as preparation for the second week (the speakers were instructed to design the talks for the graduate students in the audience). There were also evening problem sessions, much like with the summer school, which were also intended for the graduate students to practice what they had learned in the morning. Since there was also a computational component to the workshop, a lot of the evening sessions actually focused on learning Sage. Mathematicians on the verge of a breakthrough. Clockwise from left corner: Gonzalo Tornaria, David Roberts, Pascal Molin, Henri Cohen, and Kamal Khuri. The second week of the workshop was also an AIM (American Institute of Mathematics) workshop on Hypergeometric Motives. The AIM-style workshop is great especially because it is designed for people to collaborate on new problems, and often leads to new results and insights into said problems. 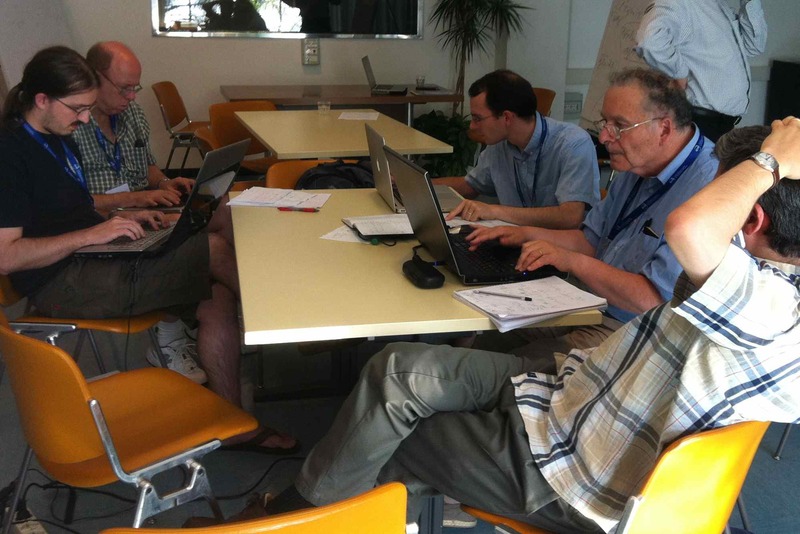 This week, there were only a couple of talks in the morning and the afternoon was devoted to working in groups. I must admit I was slightly intimidated by the group, which included people like John Tate, Don Zagier, Henri Cohen, Frits Beukers, Philip Candelas, John Cremona, Xenia de la Ossa, and Fernando Rodriguez-Villegas (my PhD advisor), just to name a few. But in the end I settled in nicely with a couple of people, and even though I felt like I wasn’t contributing nearly as much as others (but with this crowd, that is not surprising) I learned an incredible amount and on top of that came out feeling less intimidated by big-name mathematicians. My group didn’t make any huge discoveries, but another group did eventually make a breakthrough, and being there and seeing them figure this out was really fun and exciting. I am not going to write here about the math, but I am currently writing an article about the conference (with math details) so stay tuned for that. Coding. From left to right: yours truly, Bianca Thompson, Stephanie Treneer, Holly Swisher, and Jennifer Balakrishnan. 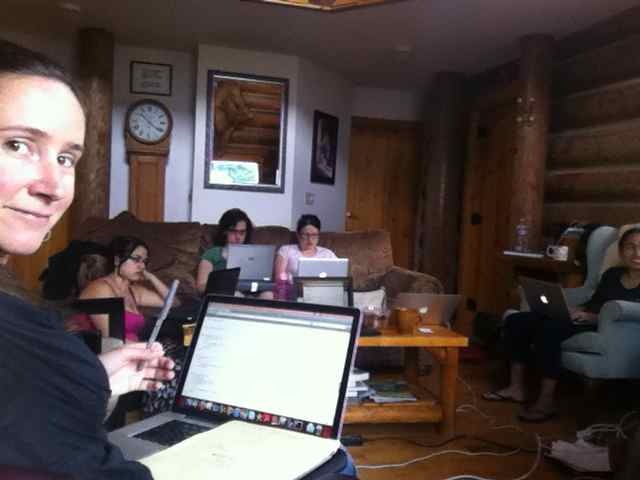 My last workshop of the summer was Sage Days 42: Women in Sage 3, held in July at the Wallace Falls Lodge outside of Seattle. This was a different conference in that it heavily emphasized the computational side, but from a development point of view. If you are unfamiliar with Sage, it is free, open-source software for making mathematical computations, based on Python. According to the website, the mission is to create “a viable free open source alternative to Magma, Maple, Mathematica and Matlab. ” There are about 200 developers worldwide working on making it as complete a mathematical software as possible. The Sage Days conferences are essentially “coding sprints”, where people get together and try to write new code and patches for the existing software. In this sense, Sage is always growing and improving. This particular Sage Days was intended for women, the idea being that women, who are already underrepresented in mathematics, are even more underrepresented in computer science. 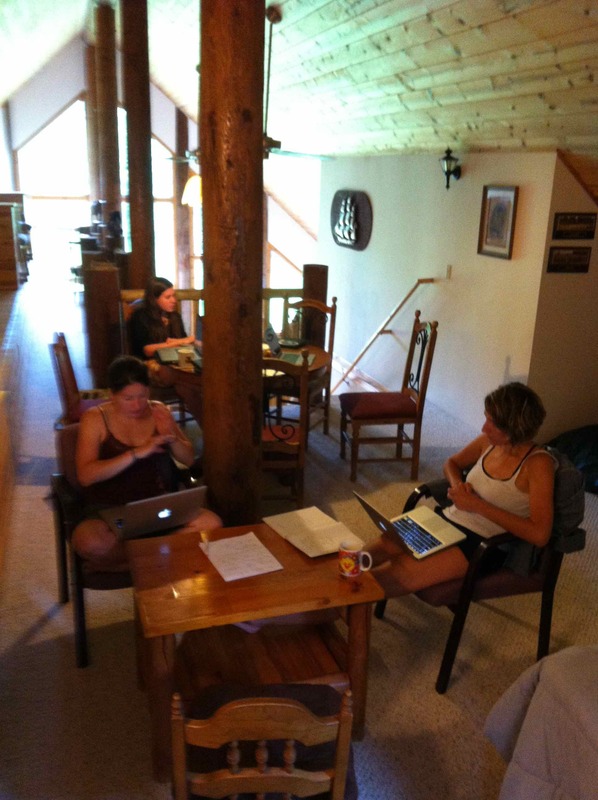 The lodge had many work spaces to take advantage of. From left to right: Holly Swisher, Lola Thompson, and Anna Haensch. These Sage Days, funded by Microsoft Research (via Kristin Lauter) and The Beatrice Yormark Fund for Women in Mathematics, were held to attract more women developers into this large Sage community. The workshop itself just had a few introductory lectures on the first day by the three group leaders, and then, much like with AIM style workshops, people split up into the groups they wanted to work with. The rest of the workshop (it started on a Monday morning and ended Wednesday night) we were working on math and coding pretty much non-stop (sometimes people would go for a walk, the evenings were a bit more social, and Wednesday afternoon we hiked to Wallace Falls). This is the most productive I felt all summer, and I also really enjoyed working with the other women mathematicians (not just because they were women, though, they were all very fun to be around). It is great to work very hard with a group of people who are so happy to be working and who love mathematics. We even wrote a song! On top of all the things that I mentioned, workshops also have the benefits of regular conferences. There is still an exchange of ideas and you still get to find out about recent results. Like I mentioned, there are still (and still need to be) some talks. But also, just by spending time working with people and talking to them you get to learn about new mathematics and about what other people are working on. I also think that networking is a good reason to attend a conference, although I’m reluctant to use that word because sometimes it sounds a little phony. What I mean is that meeting other people, talking to them, and making connections are important to your career as a mathematician. But you want the interactions to be genuine, and a workshop is an ideal place for that to happen. And lastly, conferences and workshops give you a chance to travel somewhere else (although, with workshops, you have a lot less free time to explore). In my case, this summer I got to go to Athens, GA, Trieste, Italy, and Seattle, WA. Last year, I wrote a blog post about conference travel, you can go here if you’re interested in reading more about that. Now, I hand it over to you, dear readers. Do you like workshops as much as I do? Have you had any great results come from a workshop? Are there any others that you can recommend to people? Please share your thoughts and comments below. This entry was posted in conferences, networking, research, sage, women in math, workshops. Bookmark the permalink.